The biggest challenge in interpreting Rebecca Young and the shop she ran was not how flags were made (an appointment at the Cultural Resource Center of the National Museum of the American Indian answered that question*), but rather how to make sewing interesting, and how to create a more interactive experience for ourselves and for visitors. 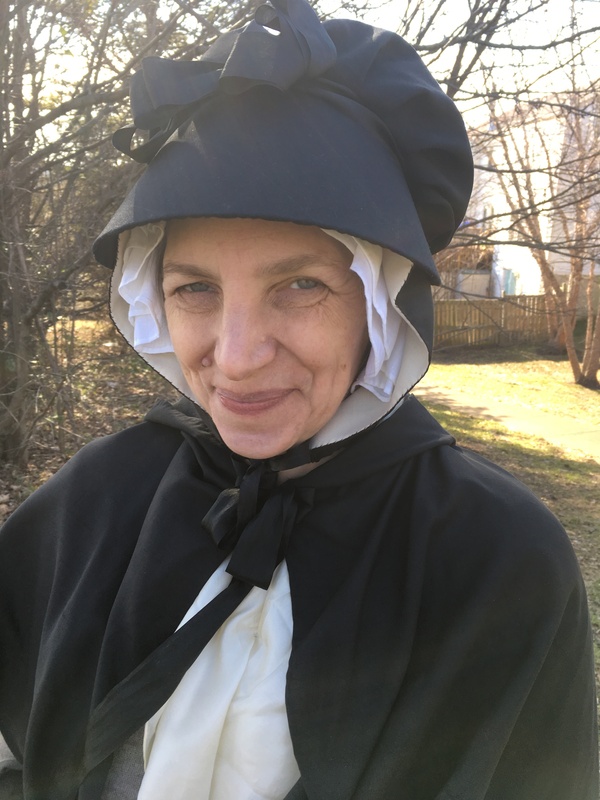 Some of my favorite living history experiences involve playing off other interpreters and the public, especially when trying to convince visitors to pick a side, carry a message, or share a secret. Saturday’s set up made that harder, with Rebecca’s shop of women behind a table (we wanted to be sure to be open to visitors, and not make the dreaded reenactor circle), and with Drunk Tailor rolling cartridges in a niche. Nobody puts Drunk Tailor in a niche. But what we saw on Saturday– a day with 800 visitors–was that boys between roughly six and 16 skipped from Drunk Tailor to the tailors, bypassing a table of women altogether. Older men (say, 45+) visiting alone also skipped our table, while the majority of our visitors were girls and women. This was not a surprise. Children begin to develop gender segregation around ages five to six, and sewing is often dismissed as “women’s work,” as the table of tailors experienced. These cultural biases were somewhat compounded by the nature of our work. Sewing is one of those tasks that is downward-facing, internal, and meditative (until the thread tangles or snaps). It’s dull to watch, really; the exciting parts of sewing and making are draping, fitting, and cutting. Cutting. There’s something to that. Combining the desire to interact more with our co-interpreters and the need to disrupt expectations of sewing, we rearranged the tables on Sunday, moving Drunk Tailor to our end of the atrium, postulating that his tea table and powder keg were in the yard of the townhouse, while we pushed our table closer to the tailors and against the railing, pulling our chairs to the side. We also draped shirts and fabric over the railing to display shirts and their component parts, along with bunting. While this “messed up” the atrium, it helped create a context for our work. But the best, most participatory change was Mistress V cutting flag strips on the floor, with the help of two young boys. This literally disruptive activity (you had to walk around her) changed perceptions of what we were doing, and helped people imagine assembling a large item (a Continental Standard) in a small rowhouse room. If we take the Betsy Ross house** as an example of a Philadelphia rowhouse, , its exterior dimensions, roughly 16 x 25, yield an interior per-floor area of not more than 400 square feet. The Star-Spangled Banner was 30 x 42 feet; a second “storm” flag was 17 x 25 feet, large enough to cover the floor of a room in Betsy Ross house. While we do not know the exact dimensions of the flags Rebecca Young and her shop produced, it seems likely that any flag would have exceeded the size of a domestic table, since even drop-leaf dining tables of the period are not usually more than 52” x 41” or about 15 square feet (4.3 x 3.5 feet). The limited size of the table, and the need for multiple feet of cutting space makes it likely that flags larger than 3 x 5 feet were cut and pieced on the floor. This combination of thought experiment and interpretive change up was reasonably successful, giving us greater understanding as we talked about assembling goods in pieces and working in a small shop while interrupting the visitor’s expectations. *More on this another time. **You have to start somewhere– and while I’m on #TeamYoung when it comes to flag making, Rebecca’s rented house has long been razed. Research and primary source materials on Rebecca Flower Young were provided by Matthew Skic of the Museum of the American Revolution; compiled information used by gallery educators at the MoAR was compiled and provided by Katherine Becnel of the MoAR. Hoods and Caps and Bonnets, oh my! Let’s take a closer look at Griselda, Countess Stanhope. She wears a hood over a fine white cap, as well as a hooded cloak. Around her neck, she wears a fur tippet, and her hands are snuggled into a muff. While most of the “common” women in the colonies wouldn’t rise to the Countess’s ermine tippet, they did have hoods. Hoods appear fairly regularly in prints, worn over caps (as in Countess Stanhope), under hats, and even under bonnets, as in this print from the Victoria & Albert Museum. The mantelet hood worn over the bonnet, hood, and cap layers. 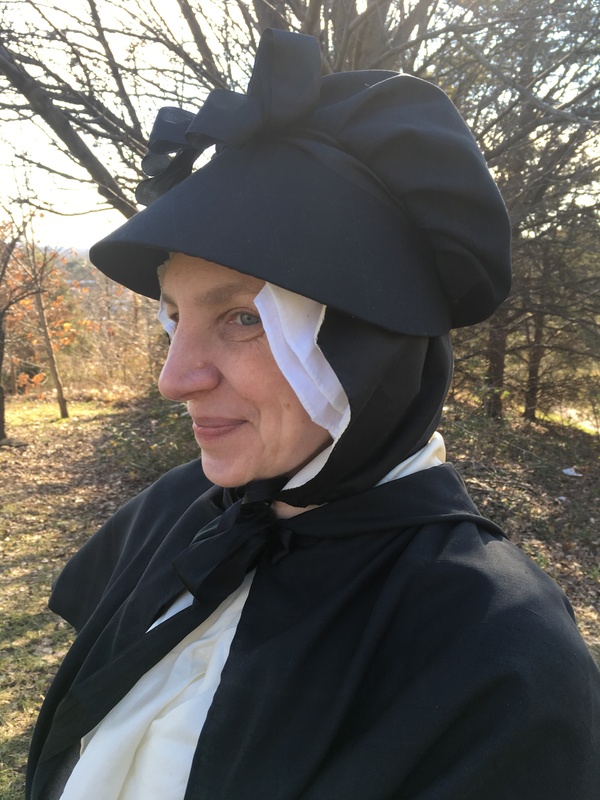 In the images above, I’m wearing a white cap, black silk hood, and black “stuff” bonnet, with a black silk mantlet over a silk neck-handkerchief. 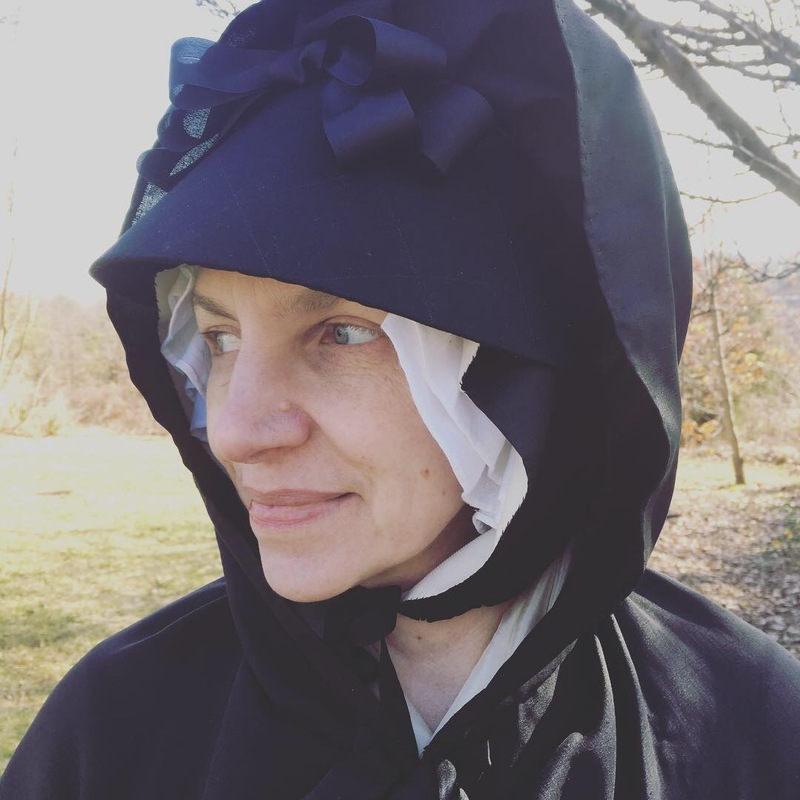 The hood needs some tweaking, size-wise, but the layers definitely recreate what we see in the print of “January.” The bonnet has an adjustable caul, so will easily fit over hair, cap, and hood; the hood has a drawstring closure at the neck that helps keep out the wind. Taken altogether, these layers are definitely insulating! Looking like an 18th century engraving is almost a bonus– but when you wear what they wore, you look like they did. Gentle readers: I’m planning 2019 and while I have some ideas for new things to offer on Etsy, I’m also open to your input. On my mind for this year: winter hoods, new collapsing bonnets, and shaped reticules. What’s on your mind? Please do me the favor of completing this survey! Miniature painting, probably 1815-1820. Private collection. The best things turn up when I’m looking for something else entirely. First came the miniature, now in a private collection, with the lovely carnelian or coral jewelry and the bright yellow dress. I’ve got some yellow cotton with a red and black print pattern in the cupboard, so this dress seemed within reach. And then, while looking for something else, I found the right fabric! Not that I can buy it, mind you. It’s already owned and in use, in a gown at the Philadelphia Museum of Art. And not that I haven’t spent some quality time searching the interwebs for similar fabric, which can be found if you look hard enough. Fortunately, better sense prevailed and no cupboard will burst with an additional five yards of block printed silk. Still, the fun bit is finding two such similar thoughts, one in paint and one in cloth, without even looking. that means there are more bright yellow Federal or Regency gowns out there. All it will take is the looking.